Welcome to the Vienna Branch of the Royal Scottish Country Dance Society! 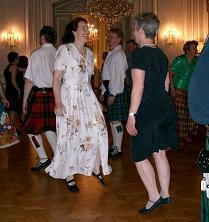 The Vienna Branch of the RSCDS, founded in 1989, is the home of Scottish country dancing in Vienna. Thus, in 2019 we are celebrating the 30th Anniversary with a Dance Weekend for advanced dancers. Central to the club's activities is the weekly course, which includes a session for beginners and then time for more advanced dancing. An introductory ladies' step class is also offered. We perform at charity events, weddings and any occasion where an extra Scottish touch is needed, see our flyer. At various times during the year we hold social dances for our guests and ourselves or travel to neighbouring clubs to join in with them. Scottish country dancers visiting Vienna are of course most welcome to join us for an evening: please contact the Secretary.